Asking the Witness Leading Questions (that Suggest the Intended Answer) - В сложной финансовой ситуации приходит на помощь кредит наличными в Казахстане. 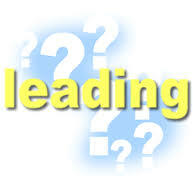 A leading question is a question asked of a witness that already suggests the witness’ answer. A leading question is asked by a lawyer to clue the witness to the intended answer he/she is seeking from the witness. This means that leading questions are generally prohibited during direct examination or redirect examination. During direct examination and redirect examination, you generally cannot ask a witness questions that already suggest the intended answer you are seeking. Thus, when you are calling your client (a representative of the party) to provide testimony on direct examination, you cannot ask your client leading questions. There are, however, exceptions to the general prohibition of asking leading questions on direct examination. One such exception, as identified in the rule above, is a witness identified with an adverse party. In this circumstance, you can ask the witness leading questions during direct examination. See, e.g., Charles W. Ehrhardt, Florida Evidence, s. 612.1 (2015) (“Being a former or present employee, a co-worker, a relative, or having a romantic interest in an adverse party is sufficient to find that a witness is identified with an adverse party and leading questions are automatically permitted during direct examination. So too, an officer, director, or managing agent of a public or private corporation or of a partnership or association who is an adverse party are witnesses identified with an adverse party under section 90.612(3).”). Keep in mind, though, that if you call an adverse party to the witness stand, the adverse party’s own counsel may be able to ask leading questions to that party on cross-examination. See Brookbank v. Mathieu, 152 So.2d 526, 528-29 (Fla. 3d DCA 1963); accord Florida Power Corp. v. Smith, 202 So.2d 872 (Fla. 2d DCA 1967). For this reason, sometimes it is better to read the adverse party’s deposition transcript during direct examination as opposed to calling that party to the witness stand.